Now this Condo is On-the-Water! Well maybe not technically, but its about close to the waters edge as you`ll ever find at the Lake of the Ozarks!!! Cheerful, bright, and cute, cute, cute, that`s what we think when we enter this delightful Weston Point - 2 Bedroom Condo. Conveniently located at the end of the Hwy KK Peninsula in Osage Beach, this 2 bedroom has a .75 bath in the Mstr. Bedroom and another .75 bath serving in the second bedroom. From the deck you have a view from the immediate shoreline all the way across the main channel of the Osage Arm. 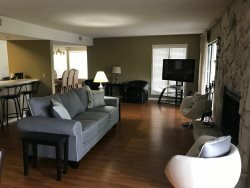 M/M 23, very near to Red Heads, Shorty Pants and Paradise restaurants.This Condo is priced right and ready for you to get acquainted! Don`t delay get your dates reserved today.